Yesterday I lead a edible container building workshop for members of Food Matters Columbus. We claimed a few picnic tables at Whetstone Park and planted away. Today, Lil wanted to make a garden just like the workshop. So we did! Lil was happy to get her hands dirty filling the container. She planted a tomato seedling, radishes, endive, and basil for me and mint for her. Lil decorated each label with her interpretation of what the vegetable looks like. 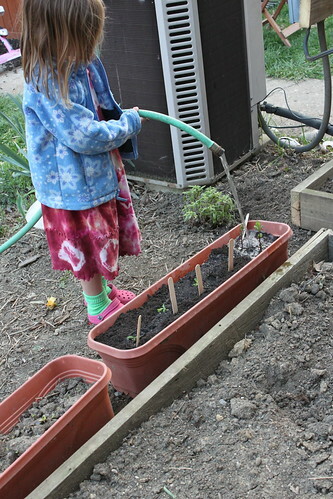 Just before going in for bed, Lil used the rain barrel hose to water her new garden. 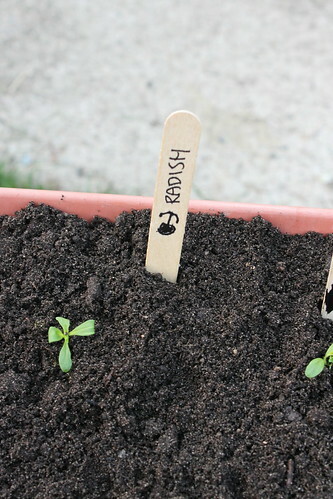 1.Label row markers with the plants you choose. At a maximum, choose one variety of tomato, two herbs, and two seeds. 2. 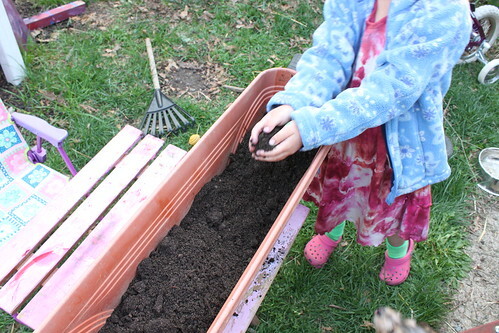 Fill container with soil to within one inch of the top, mixing in two scoops of peat moss if you have it. 3. Place row markers. Tomatoes should be planted at an end so they will not shade everything. 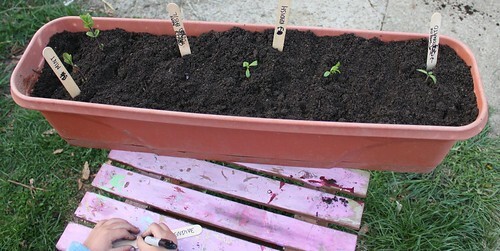 Herbs and lettuce need 4 or 5 inch spacing. 4. Plant seedlings by hollowing out a small hole in the soil. Plant deep enough that the dirt covers a quarter inch of the stem. Cover with removed soil. 5. 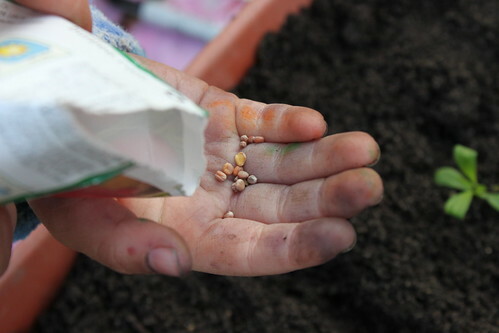 Scatter seeds (five to eight seeds per variety). 1. Place in a sunny location. If necessary, move throughout the day to chase the best sunlight. Orient the container such that the tomato will not shade the rest of the plants (generally towards the north east). 2. Water immediately upon placement. Continue watering whenever soil is dry a half inch deep. 3. Watch the weather for hard frosts. If one is forecast, bring your container inside for the night or cover with a sheet or tarp for the evening. 4. When plants develop, harvest tomatos by plucking them off the vine. Lettuces and herbs can be snipped with scissors or gently torn from the plant. They will continue to produce new leaves. 5. If herbs or lettuces develop flowers, snip or pinch those off. When plants go into flower production, the leaves become bitter. If you remove the buds you can enjoy the leaves longer. 6. When it gets very hot, lettuce will become bitter. Remove the plant. In late August or early September you can replant lettuce and it will grow outdoors until the first fall hard frost.